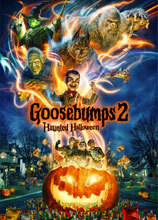 Aroview: Following on from the popular 2015 big screen adaptation, two young boys accidentally unleash a cacophony of monsters and demons after they open an unpublished Goosebumps manuscript. Jack Black reprises his role as the author R. L. Stine. Rental (In-store only) Available for Home-Delivery from Apr 23.